I admit it...I love distressed brown leather. I guess the reason I like it is that it looks better the more it gets used and all banged up. The sign of well-loved distressed leather case is the marks it bears! 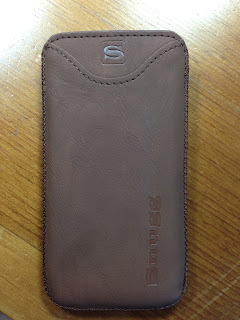 When Snugg wrote me and asked me to review an item from their site, I was drawn to the Snugg iPhone 5 Distressed Leather Brown Pouch Case for two reasons. 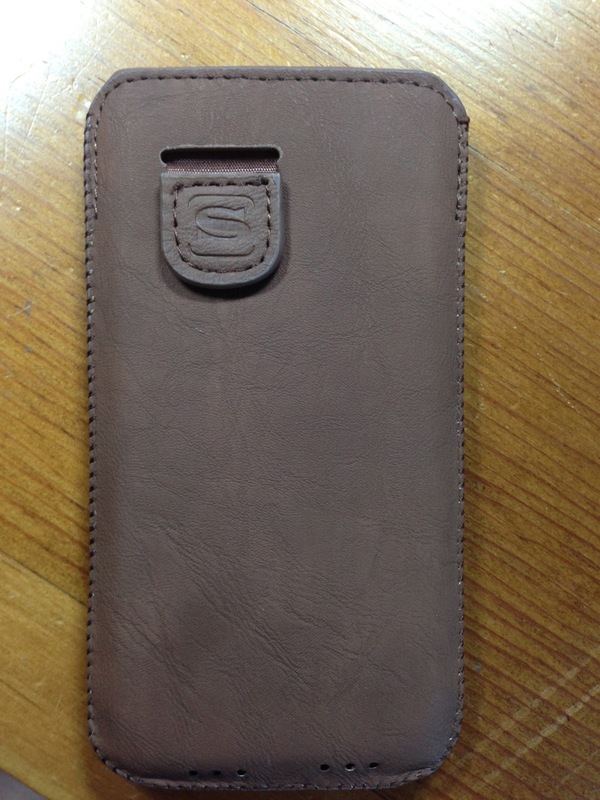 The distressed leather material caught my eye, and, even more importantly, this case was an updated version of my favorite iPhone case of all time! I always try to find a tight-fighting pouch case for my phone. A few years ago, Brookstone sold an iPhone 4 pouch case that had a tab on the back to pull up the phone for easily getting it out of the case. However, they have no plans to make one for the larger iPhone 5. 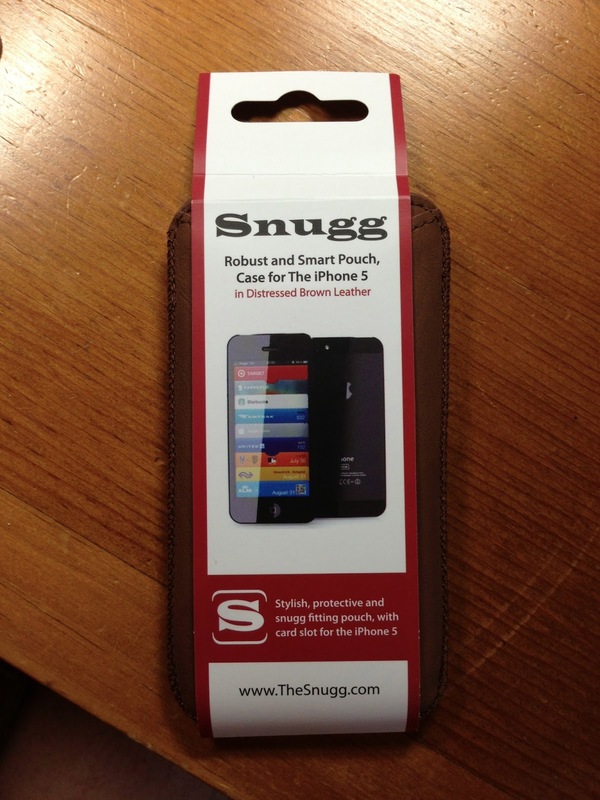 I was so excited to see this Snugg iPhone 5 Pouch Case which has the same feature-- a tab on the back (that magnetically sticks to the back of the case) which is attached to an elastic strap to pull out the phone. It also includes a credit card slot on the front that will hold a one or two cards. I made the short video below which demonstrates how well the tab works. 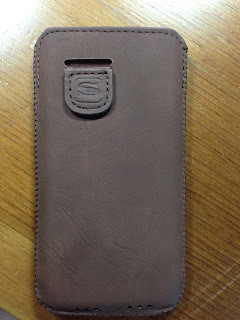 This is my dream iPhone 5 slipcase-- distressed leather, thin and tight-fitting, protective, and an easy way to get the iPhone 5 out! 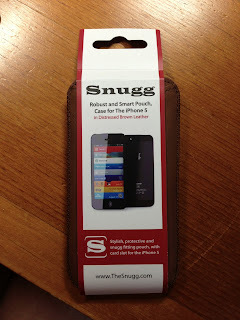 The Snugg iPhone 5 Distressed Leather Brown Pouch Case comes in distressed brown leather, black leather and tan suede. It is also available for the iPhone 4 and 4S. I ran to my Best Buy store on Sunday, the day the Best Buy was slated to start selling the Pebble Watch. However, due to the holiday the week before, the shipping schedule was off and there were none yet in the store. However, the Best Buy employee assured me he would call me when they came in, and he did, and I was able to get one (of the two!) that arrived. It is definitely a cool device. However, since there are not a lot of them out on the street yet, it is truly an early-adopter's dream! I had to work hard to learn how it worked and, more importantly, the best ways to make it work for me. The Pebble, for those of you that do not know, is a smartwatch that interfaces with your Android smartphone or iPhone via Bluetooth to provide notifications on your wrist. I would call it a pseudo-smartwatch since you cannot use it to send anything back. You can receive phone call info and SMS messages and you can control the music on your iPhone via the Pebble, set up to four reminder alarms, and, of course, change your clock face at will! The Pebble watch has an e-ink display (like the original Kindles) and can be easily read in the sunlight. There is also a back-light for use in the dark and you can simply shake your wrist to make the light comes on. Here is an unboxing video posted on Sunday from a user who has an Android device, but the set-up on the iPhone is pretty much the same. It does not come with any real directions, probably because it is still a work in progress, but Pebble has information on their site to help you out. If you start searching for ideas, you might get confused between the Android phone owners and the iOS phone owners as to the capabilities of the watch. The new iPhone iOS 7 is going to allow notifications from third-party apps and to devices via Bluetooth which will be a boon for the iPhone/Pebble-owners crowd. I started to use some workarounds with Pushover and IFTTT, which will work for some things, but once I realized, if I only had everything I wanted to be notified about sent to SMS, I could easily receive the updates on the Pebble. Since I already had my Twitter direct messages sent via SMS, I asked Adam Bellow to send me a DM so I could see how that worked. He is too funny! I wanted my iCal appointment reminders to go to my Pebble, but, as the iOS instructions for setting up notifications page states, that functionality is coming soon to the Pebble. However, I knew there had to be a way to make that happen and I searched "sending iCal reminders to SMS" and came up with this great workaround that totally makes sense-- just use the email equivalent of your mobile phone number (mobile phone number followed by @ mobile company designated address) and send the appointment reminder to that email address! Here are the instructions and it worked like a charm! Another tip-- if you cannot get an app or watchface to install from your phone app, use the desktop, go to the site, download the .pbw files to yourself, and install them via the email app on your device. Pick them to open in the Pebble App. Tip #3: You can make a QR code and put it as a watchface in your Pebble and you will always have your contact info ready to share! It needs to be 144x144 pixels. Do you have a Pebble watch yet? Any ideas for use in the classroom?